Recently remodeled comfort in first class condominium community. On site property management, 3 inviting swimming pools, new tennis courts, lounge chairs on the beautiful beach all set within the impeccably landscaped grounds. Enjoy breathtaking sunsets over the ocean and behind the mountains. Watch migrating Grey whales breaching during the day, stroll miles of pristine beach, catch a sunset horseback ride, or snorkel nearby reefs. However you decide to spend your time at Casa Del Mar, this is one of the best developments in Los Cabos. The two bedrooms feature a king in the master suite and two double beds in the second bedroom and full bath including an oversize walk-in shower. Relax in the sunken living room with complete entertainment center including a new (2016) smart tv. Enjoy meals in the dining area that seats 6 with comfort. Mexican tile, marble and natural wood decorate the interior. Feel the quality of granite counter tops, all new appliances and cabinets in the tastefully appointed kitchen designed for the serious home chef. The patio is inviting with all new furniture herb garden, and flowering plants. Schedule your tee time on the Trent Jones Golf Course at Cabo Real. The Club House is a short walk-or call for a cart. Don’t forget your tennis racket. The courts were newly resurfaced in 2015 and include one with grass. In the evening drive or taxi, or take a public bus to the internationally famous 'Club Mecca,' of Cabo San Lucas or the quieter colonial San Jose Del Cabo. Fine dining and entertainment is abundant in both. Return for a nightcap on the patio or a walk on the beach at beautiful Casa Del Mar. Wake early to experience world class marlin fishing from Cabo San Lucas or hire a panga to fish the calmer Sea of Cortez. Either way you will catch your limit of Dorado, Red Snapper or Tuna. Occasionally, Sierra are biting right off the beach at CDM. Why not spend the day snorkeling and rock climbing at Chileno Beach, a 5 minute drive. Save one evening for the ATV tour of the Pacific Sand Dunes at sunset!. 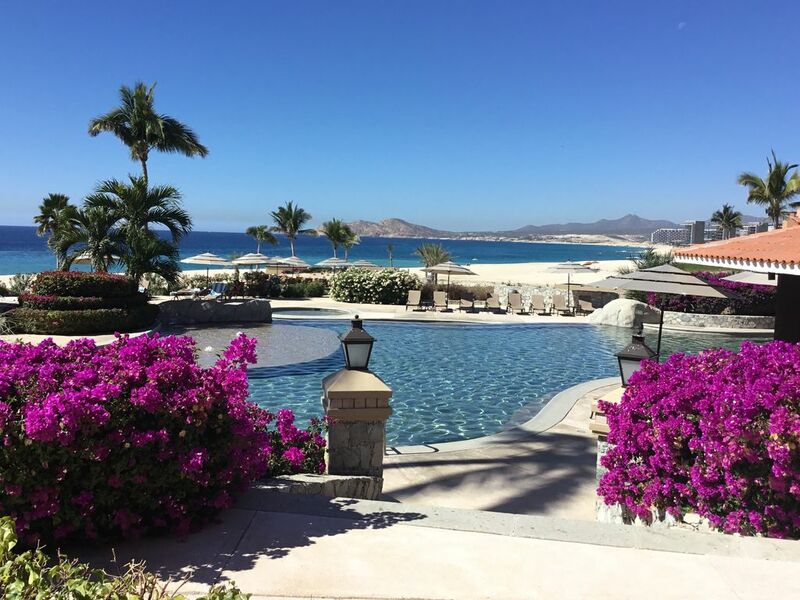 Keywords: two bedroom rental condo, beach resort, golf resort, ocean access, Los Cabos Corridor, Baja Mexico, ocean fishing, whale watching, desert topography. Sonoran Desert, low density, secluded beach, romantic getaway. We are retired, living in Southwest Michigan in a beach community on Lake Michigan. We love Beaches! Steve is a money manager. Cindy owned a healthcare management company for 20 years in Chicago. We have enjoyed the adventure of owning this property and have many years of memories with our two daughters and friends. We have enjoyed meeting many visitors and residents who share our passion for Mexican culture. When we first visited Cabo in 1993, it was remote and undeveloped - large bovine frequented Rt 1. When we saw the plans for Casa Del Mar, we knew that quality properties like this don't come along often. We bought on the chalk line (and we are NOT impulsive people, it was that beautiful). We have not been disappointed in the workmanship, landscaping, amenities and location, location, location of this property. We have visited every year for 20 years. Every unit has nothing between it and the ocean. What is called ocean view in Casa Del Mar is oceanfront in other developments. We love it and know you will too. We look forward to having you in our casa. You will feel the low density development of Cabo Real. No building in CDM is over 4 stories and well landscaped open space provides you with a sense of privacy that you will not find elsewhere in Los Cabos. You may often feel all alone on the beautiful streaches of beach. Explore Old Mexico in the village of San Jose, and exotic late nightlife in Cabo San Lucas. Both are accessible but not too close to disturb your beach tranquility. There is nothing between you and the beach/ocean. beautiful views from the nearby golf course. Whales can be seen from shore during the calving season Dec - Mar. all new kitchen in Nov, 2011. Expanded and installed all new appliances and cabinets. High reviews so far. large glass top table seats 6 with comfort. Basic package from Sky Cable. New "smart " tv installed in 2016. Includes Netflix, no charge. Use your own password for Amazon, Hulu, etc. A selection of dvd's left behind by guests. Ample open space for lawn and plants. Casa Dell Mar is the lowest density development on the beaurtiful corridor. Our landscaing is second to none. Best beach on the corridor. Adjacent to Los Ventanas, short walk to Hilton for food and cocktails.Cabo Real Golf course across the street. Merkado food court 5 min away. Smart tv (2016) TV in all rooms (3), DVD/CD player. IPOD player. Horseback Riding available on the beach. Desert trails as well as jumping, dressage and equitation lessons available at nearby facility, wave runner and kayak rentals, World-Class Marlin Fishing, Panga Fishing, Whale Watching Tours, Ultra Light Rides, Atv Sand Dune Rides.